Use WFR's Worm Farming Presentation to teach 100's of budding and like-minded composting enthusiasts. Don't know how to connect with your audience? This well, thought-out multi slide will allow you to command your audience's attention from the very first, "Hello my name is...!" 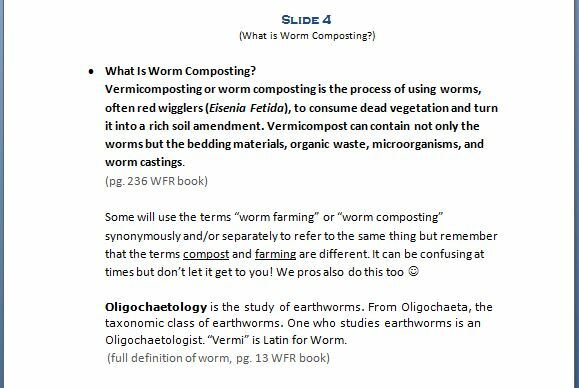 The Worm Farming Presentation is designed to captivate and entertain your listeners through quality, factual information based on the author's years of hands-on experience in the field. It also quotes university publications. OH! Did I mention that it can be FULLY customized too? The Microsoft PowerPoint is 100% editable! Use all of it or parts of it. Use it as a guideline if you wish. 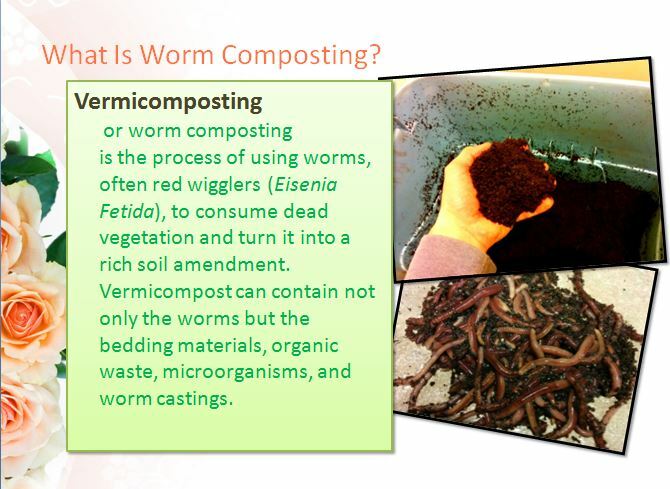 That's what's so cool about being able to edit anything in the vermicomposting presentation. There's a lot within the 36 slides. It's bound to ignite, inspire, and unlock many words screaming from within you already. Especially when you read the slide guide. 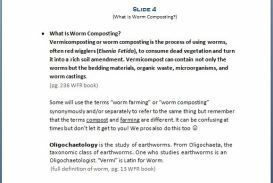 So what is the "SLIDE GUIDE"
The Worm Farming Slide Guide is for your use only. 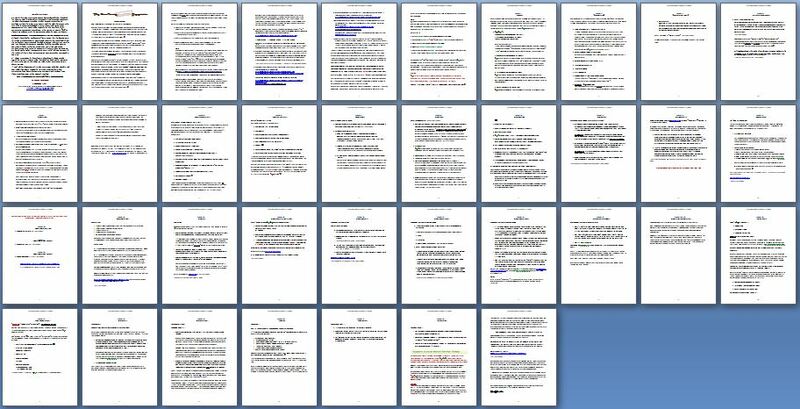 It's a 37 page guide that walks you through each slide you'll be presenting. They are my personal notes. They explain what each slide is about and goes into detail about what's on each slide. This gives you a better understanding and knowledge into the subject matter when you're presenting the slides to your audience. It's like an instruction manual for each slide. Each page is crafted for that particular slide. You'll never run out of ANYTHING to say. Below is a closer look at slide1 and slide guide1. Above wording can be edited to say whatever you want it to. Below is the guide to slide 1 and why I said what's on slide 1. In the guide, I will ask you some questions and talk about topics before getting into the slides. These bullet points will help set the stage for you to think about the direction you want to take the audience. It will, no doubt, spawn more questions causing you to write even more great content for your audience. If you combine the Slides and the Guides that's 73 total. 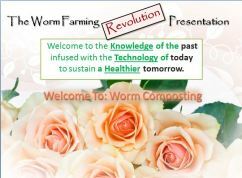 How long is the Worm Farming Presentation? It's generally about 60 to 90 min, but this depends on how elaborate you are, how many questions the audience asks, and if you choose to build a worm bin in front of the audience. Is this presentation for kids? No, unfortunately it's geared more towards adults who love to garden, recycle, or raise fishing worms, but a mixed multitude will enjoy it very much. The Composting Presentation is in a Microsoft PowerPoint Presentation file. You may be able to find other programs to run the presentation, but I can't give you support for that. The "Slide Guides" are in an easy-to-read Word Document file. You can also edit all of the guides. What parts can be edited? As stated before, this is your presentation you can delete, move, add, highlight, underline, bold, increase font or pic sizes, etc. You can delete my pics and use your own or just delete the pics altogether. Literally every field can be edited. Can the audience see the slide guides? NO! They are for your personal inspiration & enlightenment. They only explain the slides in great detail and are not part of the Presentation. The audience will NOT see them. Can I give you credit or point people to your Website? You do not have to support me in any way. This is your presentation and your audience. 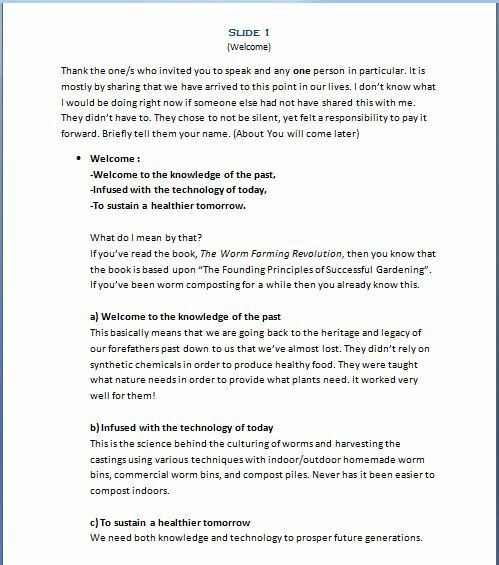 You supported me when you purchased the Worm Farming Presentation. I ask no more from you. This is actually the perfect time to capitalize on your audience's excitement and enthusiasm. It's a time for a call to action to get them to purchase or support you in any way possible. However, you are welcome to support my mission too and point people this direction if you're not equipped to accommodate them in certain areas. Can I order, download, and get started today? Absolutely! PayPal handles all transactions and takes any form of payment. You don't need a PayPal account. Download in an easy .zip file and contains two files. Learn from a Guy Who's Not Just Book-Smart, But Has Years of Hands-On Experience in the Field. I Love It & Live It! The Presentation is in English and available in most countries. Your purchase will help support future information. If you have any questions about the product or need product support, please contact us. This order is separate from all other transactions.